On the Cover: Socrates declared he knew nothing except the fact of his ignorance. Indeed, when it comes to Mars, the more we see, the less we understand, thus realizing the extent of our ignorance. This Mars Orbiter Laser Altimeter (MOLA) image of the Red Planet’s Argyre Planitia was produced by combining MOLA altimetry with color from a Viking image mosaic. The Argyre impact basin, measuring 1,200 kilometers (about 745 miles) in diameter, formed when a large object struck Mars about 4 billion years ago. 4 Opinion: Let's Put Martian Life First: Chris McKay shares his thoughts with our members. 6 Cosmos 1 Test Capsule Repaired After Prelaunch Accident: Louis Friedman reports on the accident that took place in April while preparing for launch. 10 Solar Sail Watch: Coming Soon to a Backyard Near You: Susan Lendroth gives the details on what to expect and how to prepare for the Cosmos 1 launch. 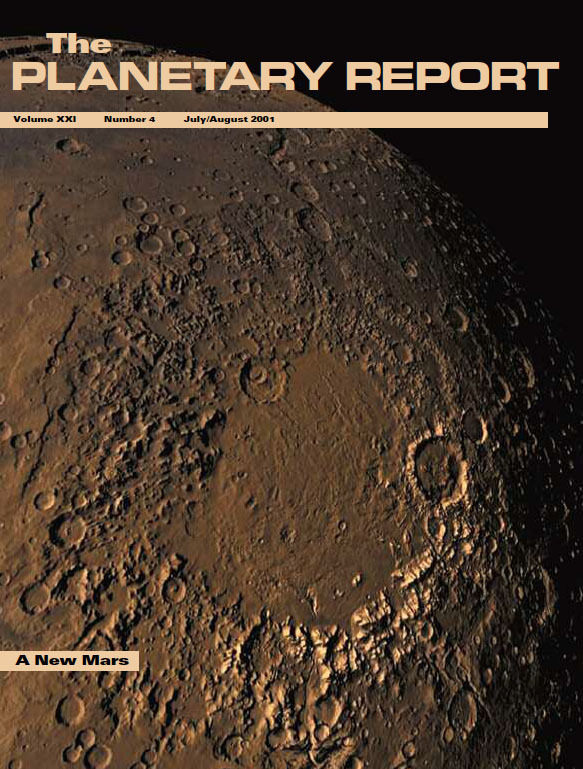 12 Mars, Old and New: A Personal View by Bruce Murray: Bruce Murray discusses how Mars Global Surveyor is shattering old paradigms of the Red Planet. 18 Merton Davies, Space Pioneer, Warmly Remembered: Bruce Murray remembers his longtime friend. 20 Q&A How do we determine coordinate systems on gas giants? Does it rain diamonds on Neptune?